Waylon Jennings—along with his friend and frequent singing partner Willie Nelson—personified the “outlaw movement” in country music during the 1970’s. At a time when the country music industry was dominated by the “Nashville Sound,” in which record companies required singers to adhere to a rigid convention of using session musicians playing certain established, commercially safe styles, Waylon and Willie demanded on doing things their own way. After years of fighting the system, they each finally won the battle in the early 1970’s. They started using their own musicians, selecting their own material, and playing in the styles that they wanted. The result was what many consider the most exciting time in the history of country music. New and younger audiences were drawn to the highly creative music of these ruggedly individualistic outlaws. And, despite the fear of change among the Nashville establishment, country music became more popular than ever before. 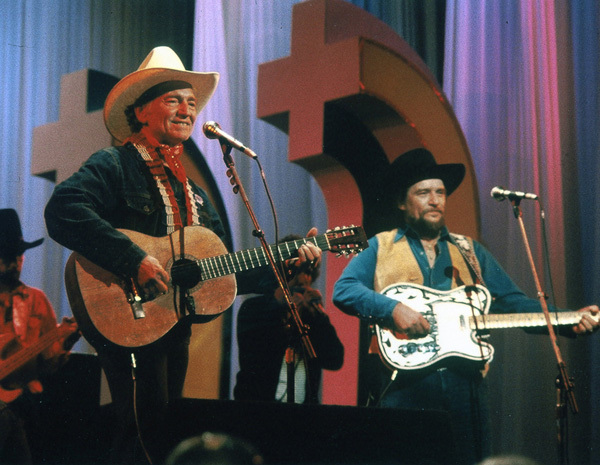 Waylon and Willie performing during one of their many TV appearances. Jennings and Nelson became linked in the public mind through their mutual fighting of the system and their many musical collaborations. However, these two extremely talented musicians were very different in their personalities and musical approaches. Willie was laid back and loose, singing in an unusual behind-the-beat style and playing his Martin acoustic guitar in ways that often resembled jazzy or even classical stylings. 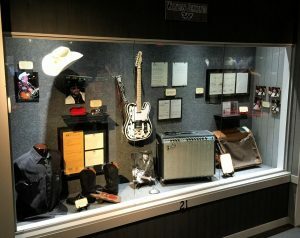 Waylon Jennings was a tightly wound mountain of energy, singing in a growling baritone and playing his Fender Telecaster with a hard-driving rock-tinged rhythm accompanied by a loud thumping bass drum. While Willie had the aura of a hippie guru about him, Waylon had a type of edgy, dangerous persona more common to rock stars. Together and separately, these very different men breathed vital new life into country music. CMT documentary about Waylon Jennings, Willie Nelson, and the “outlaw movement” of the 1970s. Waylon Arnold Jennings was born on June 15, 1937, in the small town of Littlefield in West Texas. His father, William, was an amateur musician who held various jobs, including working on a farm, driving a truck, and running a creamery and gas station. His mother Lorene, who also knew how to play music, bought Waylon his first guitar when he was a young boy. He learned his first songs from his parents. Young Waylon enjoyed listening to such music as Hank Williams, Ernest Tubb, and Bob Wills, and he liked watching cowboy movies, especially those starring Gene Autry. When he was 14 years old, he got a part-time job at a local radio station spinning records and singing and playing music with a country band he formed. After quitting high school at age 16, he worked in different jobs, including stocking shelves in a dry goods store, picking cotton, and driving a truck. He also played music at local shows with his band, the Texas Longhorns. 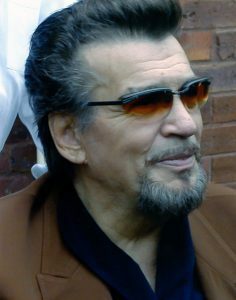 In the mid- to late 1950s, Waylon often visited Lubbock, about 35 miles from Littlefield, to play on KDAV’s Sunday Party music show, which featured area bands. He also got a job as a disc jockey at Lubbock radio station KLLL, where he spun country and rock’n’roll. While performing music and working as a DJ in Lubbock, Waylon Jennings became good friends with Buddy Holly. The two young men would often talk and play music together during Waylon’s radio shows. By the late 1950s, Holly had become a huge, nationally known rock’n’roll star. In 1958, he arranged Waylon’s first recording session. Waylon sang the Cajun classic “Jole Blon” (in which he faked his way through the French words) and “When Sin Stops (Love Begins).” Holly hired King Curtis to play saxophone on the songs. The single would be released by Brunswick in 1959, but it failed to generate much notice. Waylon Jennings in 1958 singing “When Sin Stops (Love Begins)” and “Jole Blon,” produced by Buddy Holly. King Curtis is playing saxophone. In late 1958, Holly hired Waylon to play electric bass with his band on his “Winter Dance Party Tour,” which began in January 1959. In February, Jennings was scheduled to fly on a small plane with Holly from Clear Lake, Iowa, to their next show in Moorhead, Minnesota. Holly’s death stunned Jennings, and it took him some time to recover. He initially returned to his work as a radio DJ in West Texas. He also briefly tried working as a mechanic. But in 1961, he moved to Arizona, where he worked in radio and played in Phoenix-area clubs. He soon got a job as the main act at a new nightclub in Scottsdale called J.D.’s. It was there that Waylon—and the band he formed called the Waylors—developed a unique sound that combined his aggressive electric guitar playing, his deep soulful vocals, and a diverse repertoire that incorporated country, rock, and folk. Waylon quickly established himself as a regional star with a huge following of fans. Waylon and the Waylors performing Buck Owens’ “I Don’t Care (Just As Long As You Love Me)” at J.D.’s nightclub in Scottsdale, Arizona, in late 1964. He signed a recording contract with an independent label called Trend in 1961. None of the released singles made much of an impact. In 1963, he obtained a contract with Herb Alpert’s A&M Records, which released a number of his recordings in 1964. Alpert envisioned Waylon Jennings as something of a pop-folk singer, and the resulting records were, again, unsuccessful. Jennings’ big break finally came when country singer Bobby Bare saw Waylon perform at J.D.’s one night in late 1964. He was so impressed that he persuaded Chet Atkins, his producer at RCA in Nashville, to sign Waylon. In 1965, Jennings moved to Nashville to record with RCA—despite being dissuaded to do so by Willie Nelson, who already had his own disillusioning experiences with the Nashville system. Waylon Jennings and his famous Fender Telecaster guitar. After arriving in the “capital of country music,” Waylon Jennings moved into an apartment with Johnny Cash, and the two rebel musicians began a life-long friendship. They also shared a wild hell-raising lifestyle, including addictions to amphetamines. Waylon’s first single for RCA, “That’s the Chance I’ll Have to Take,” became a minor hit in mid-1965. His first album for RCA, Folk-Country, was released in 1966. With his second single, “Stop the World (And Let Me Off),” he charted his first top-40 country hit. His first top-10 hit came with “(That’s What You Get) For Lovin’ Me” from his second album, Leavin’ Town. His third album, Nashville Rebel, was notable for the title song and for a moving ballad called “Green River.” The album was the soundtrack to an independent 1966 movie that Waylon Jennings, who had never acted in his life, surprisingly landed the lead role in after a spur-of-the-moment audition. Waylon performing “(That’s What You Get) For Lovin’ Me” on television in 1967. 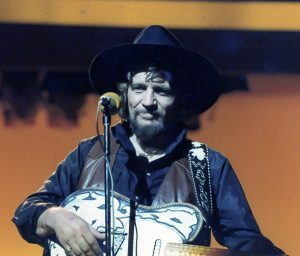 Waylon, singing with the Kimberlys folk quartet, received a Grammy Award for their 1969 version of the Jimmy Webb song “MacArthur Park,” which was a pop hit for Richard Harris the previous year. Jennings would re-record the epic ballad on his Are You Ready For The Country album in 1976. Also in 1969, Jennings married his fourth wife, singer Jessi Colter. The couple would become musical partners as well as life partners. Waylon Jennings became increasingly frustrated with the direction of his career during this period. RCA forced him to work with standard session musicians rather than his own band, and he was not always allowed to record the type of material that he wanted. Thus, the resulting records did not fully reflect the sound and style that he had in his mind. He began to exercise a little more control over his recordings with the albums The Taker/Tulsa (1971), Good Hearted Woman (1972), and Ladies Love Outlaws (1972). Some of the songs on these albums hinted at the harder-edged, rock-influenced sound that he would later develop. Waylon singing Kris Kristofferson’s “Loving Her Was Easier (Than Anything I’ll Ever Do Again),” from The Taker/Tulsa album, in 1971. In 1972, Jennings was sick in the hospital with hepatitis, disillusioned with the music business, and on the verge of quitting. His long-time drummer, Richie Albright, suggested that he try to renegotiate his contract with RCA along the terms that many rock artists enjoyed—terms that gave those artists full creative control over their recordings. Jennings took the suggestion and hired New York lawyer Neil Reshen to conduct the contract negotiations and manage his career. They warned RCA that if the label didn’t give Jennings his way, it would lose him as an artist the same way it had previously lost Willie Nelson. RCA gave into Waylon Jennings’ demands, granting him full freedom to produce his records in any way he wanted. Waylon’s first album to contain songs reflecting his new freedom was Lonesome, On’ry and Mean in 1973. The album included the rockin’ title song, the Willie Nelson song “Pretend I Never Happened,” and a version of “Me and Bobby McGee” with a highly creative bass line. Waylon Jennings took on a new look to go with his new sound. Gone was the slicked-back hair and clean-shaven face. The new Waylon sported shaggy shoulder-length hair and a beard. Waylon Jennings and his Waylors, including Ralph Mooney on steel guitar, performing “Lonesome, On’ry and Mean” live in Texas in 1975. He followed that up with The Ramblin’ Man in 1974, highlighted by “I’m a Ramblin’ Man,” “Rainy Day Woman,” “Amanda,” and a cover of the Allman Brothers’ “Midnight Rider.” Many of these songs prominently featured Waylon’s extraordinary and unique guitar skills more than ever before. Dreaming My Dreams, in 1975, featured the incredibly touching and sad title ballad and the semi-autobiographical “Waymore’s Blues.” But standing out the most was “Are You Sure Hank Done It This Way,” a pounding rock anthem with lyrics in which Waylon sharply contrasted the lame modern-day Nashville establishment with the legendary Hank Williams. Waylon Jennings version of the Marshall Tucker Band’s “Can’t You See,” from the 1976 album Are You Ready For The Country. Waylon’s records were selling like crazy, and the establishment had no choice but to acknowledge his success. The Country Music Association (CMA) named him as its Male Vocalist of the Year in 1975. Staying true to his rebel, outlaw persona, Waylon refused to attend the awards event. He proclaimed that he was opposed to the concept of artists competing for awards. This success was followed by 1977’s Ol’ Waylon, a rock-influenced collection that included what would become Waylon’s theme song, “Luckenbach, Texas (Back to the Basics of Love).” Willie joined him on vocals again. Waylon rockin’ it on stage with “Don’t You Think This Outlaw Bit’s Done Got Out of Hand” in 1979. Waylon Jennings expanded his fan base after he took on the role of the narrator of the popular television show The Dukes of Hazzard in 1979. In addition to his folksy narration, he wrote and sang the theme song “Good Old Boys,” which became his twelfth number-one country hit and the best-known song of his entire career. All that viewers normally saw of him during the show was his hand strumming his customized leather-covered Telecaster at each episode’s opening. He appeared as an on-screen actor in only one episode, during the show’s seventh and final season. Waylon Jennings and wife Jessi Coulter. While Jennings was riding high in his career as a country music superstar, he was also spending much of his time high on drugs. Years of addiction to amphetamines and cocaine, as well as decades of womanizing, were taking a serious toll on his marriage and family life as the 1970s stretched into the 1980s. The birth of his and Colter’s only child together, Waylon Albright “Shooter” Jennings, in 1979 began to prompt him to turn his life around. (Jennings had six older children from previous marriages.) After retreating to Arizona to force himself to detox, he finally succeeding in quitting drugs in 1984. Jennings continued to release albums of outstanding quality and creativity throughout the 1980s and 1990s. However, his chartings became less common as popular tastes shifted more toward younger big-hat country-pop acts, perhaps best represented by Garth Brooks. One of Waylon’s more notable albums during this period was Waylon and Jessi – Leather and Lace, a 1981 collection of duets by the married couple. 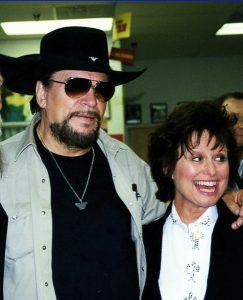 The album was highlighted by their performance on Jessi’s “Storms Never Last.” Waylon and Company, in 1983, consisted of duets with numerous partners, including Jessi, Hank Williams Jr, Ernest Tubb, Willie Nelson, Emmylou Harris, Jerry Reed, Tony Joe White, Mel Tillis, and even James Garner. Waylon and Jessi and their lovely duet on “Storms Never Last” in the early 1980s. Jennings, Nelson, Cash, and Kristofferson were united in the supergroup Highwaymen in 1985 with the album Highwayman. All four men were long-time friends, and their joy in performing together was evident on this album and during their Highwaymen concerts. The group released two follow-up albums, in 1990 and 1995. Will the Wolf Survive, in 1986, was Jennings’ first album with MCA. The collection was especially notable for the title song and for a song about living without drug dependency, called “Working Without a Net.” A Man Called Hoss, in 1987, was a very personal collection of autobiographical songs. Cowboys, Sisters, Rascals & Dirt was a 1993 album of children’s songs inspired by Waylon’s interactions with Shooter. Waylon’s “Wild Ones,” which he wrote about the wild past of himself, Willie, and Jessi, from 1994’s Waymore’s Blues (Part II). Waylon’s musical explorations continued with Right For the Time in 1996 and Closing In On the Fire in 1998. Although radio stations rarely played Jennings (or other older artists) anymore, his recordings proved that he was still a vital, creative force willing to push boundaries. In addition to making music, Jennings had some television and movie roles—though he was clearly not as gifted or prolific an actor as his old pal Willie. Two of his more interesting roles were as a truck driver in the Sesame Street movie Follow That Bird (1985) and as a gambler in the television remake of the John Wayne movie Stagecoach (1986), which also starred his fellow Highwaymen Nelson, Kristofferson, and Cash. In January 2000, Waylon and his new, expanded Waymore Blues Band recorded Never Say Die: Live at Nashville’s Ryman Auditorium. A three-disc set included two CDs with audio and one DVD with video of the concert. The performances consisted of a mix of new songs and new versions of old songs. The band, which toured from 1999 to 2001, featured unusual instrumentation for country music, including saxophone, trombone, flute, and cello. Waylon having fun with his Waymore Blues Band in 2000, including doing his impersonation of Willie Nelson. Jennings was elected into the Country Music Hall of Fame in 2001. Still sticking with his rebel ways, he did not attend the ceremony. His son Buddy accepted the honors on his behalf. Waylon’s health was in decline for many years, and he suffered from serious cardiovascular and respiratory problems. He eventually developed diabetes and associated complications, which necessitated amputation of his left foot in December 2001. On February 13, 2002, Waylon died in his sleep at his home in Arizona. He was 64. Waylon, who usually kept his religious beliefs to himself, opened up about them for his song “I Do Believe,” performed here in 1994. In 1996, Waylon: An Autobiography, written by Jennings with Lenny Kaye, was published by Warner Books. Jennings’ eldest son, Terry Jennings, with David Thomas, wrote Waylon: Tales of My Outlaw Dad, published by Hachette Books in 2016. Jessi Colter, with David Ritz, wrote An Outlaw and a Lady: A Memoir of Music, Life with Waylon, and the Faith That Brought Me Home, published by Nelson Books in 2017.